Today I had to hold the church coffee hour without my friend Lizzie who flew to Florida to see her dad. She flew to Florida! On a Sunday morning! What was she thinking? Luckily I had a lot of help from friends at church. Also Lizzie made clam chowder for the coffee hour even though she would not be there. That is Catholic guilt! You cook for the coffee hour even when you will not be there to eat it. I got to church 45 minutes early and I was nervous. I love to cook but situations where I have to be organized and know where stuff is do not bring out the best in me. And I got this great surprise when I walked in and the room was ready! The coffee was percolating away and tablecloths were on the tables. It was Bonnie who did it. Bonny Bonnie had set the coffee going and had also put on the tablecloths. 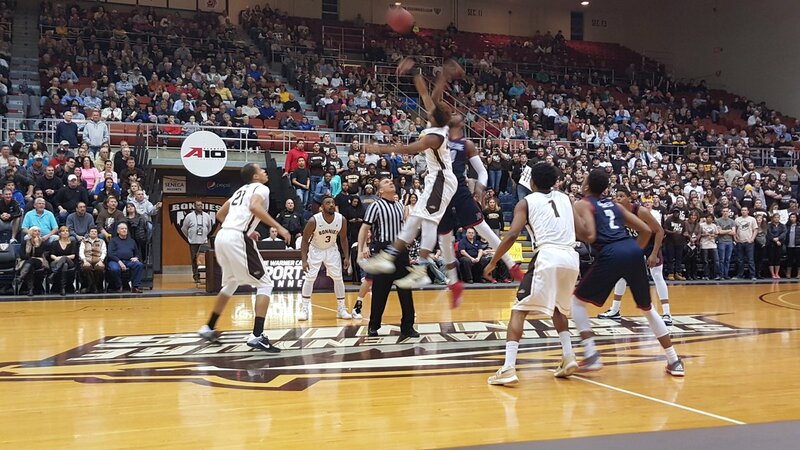 What about the St. Bonaventure Bonnies? 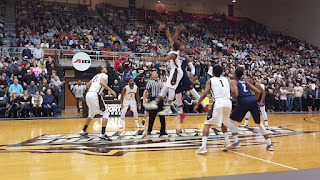 I went the other day and watched them win against Duquesne. That was never anything I thought I would do and it was an unforgettable experience! As was this coffee hour. 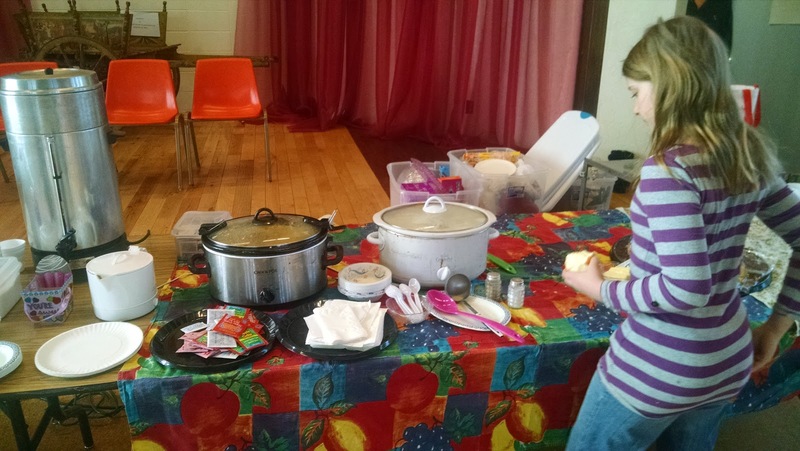 Bonnie had already gone over to church and as I was trying to get set up, my brother George showed up with my niece and nephew and a Crock Pot and they helped me. Did God provide or what? Barbara, up above, arranged the cookies artistically. 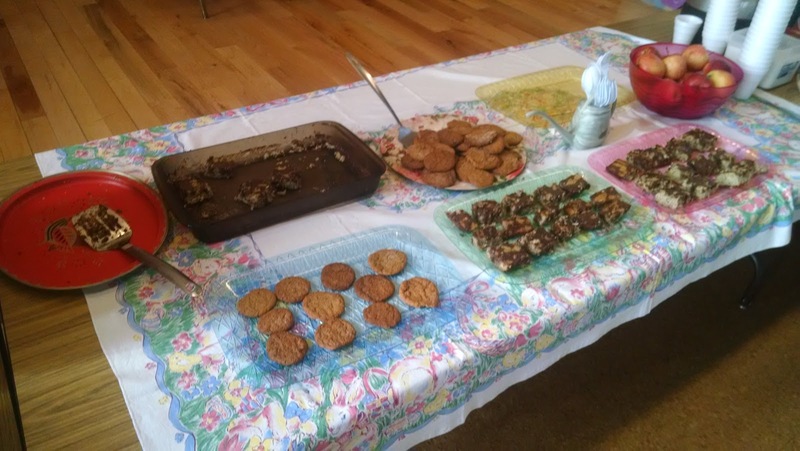 I had made these sticky banana brownies I found online, and gingersnaps from Martha Stewart Healthy Quick Cook. Isn't that beautiful? And observe that cute little watering can holding the cutlery. Barbara brought that to add a spring touch to the table. So sweet! So, all in all, a success. The only thing that went wrong was that the coffee that I had heard burbling away somehow became unplugged. I do not know how because if I had tripped over it or something, I would know! So the coffee was not as hot as usual. The joke, incredibly not started by me, went around that Protestants had sneaked in and unplugged our coffee pot. Ha, ha! Whatever happened, I am weak with relief we got through this without Lizzie, albeit with her great help. I keep thinking: She'll be back in two weeks. She'll be back in two weeks. Meanwhile we are holding the fort!